Received: April 25, 2018; Revised: October 22, 2018; Accepted: October 22, 2018.; Published online: February 5, 2019. Epiphrenic diverticula are known to cause a series of complications. We report the case of a 54-year-old woman who was diagnosed with an epiphrenic diverticulum at a regular checkup in November 2006. Ten years later, she presented with massive hematemesis. Imaging studies revealed an epiphrenic diverticulum measuring 7.8 cm in diameter and a large amount of bleeding inside the diverticulum. Computed tomography showed fistula formation between the diverticulum and the left lower lobe of the lung, leading to the development of a pulmonary abscess. Diverticulectomy and 180° posterior partial fundoplication were performed transabdominally. The pulmonary abscess was treated with antibiotics alone. She was discharged 16 days after the operation without any complications over 7 months of follow-up. A 54-year-old woman was diagnosed with an esophageal diverticulum at a regular checkup in November 2006. No treatment was needed because the size of the diverticulum was small and she was asymptomatic. In September 2015, she presented with mild regurgitation and dysphagia. An esophagogastroduodenoscopic examination showed no specific abnormalities, and she was treated conservatively. She returned to the emergency department 5 months later with massive hematemesis. An esophagogastroduodenoscopic examination revealed a Dieulafoy lesion within the diverticulum, in addition to a large hematoma (Fig. 1), and she underwent a clipping procedure. The esophagogram showed an epiphrenic diverticulum measuring 7.8 cm in diameter located 5 cm above the gastroesophageal junction (Fig. 2). Surgical treatment was indicated; however, because of her poor nutritional condition and comorbidities, surgery had to be put on hold. Her body mass index was 14.86 kg/m2, and her weight was 33 kg and height was 149 cm. Her Eastern Cooperative Oncology Group performance status was only 3. The forced expiratory volume in 1 second was 58% and diffusing capacity of carbon monoxide was 38% of the expected value. She performed the 6-minute walk test but could only cover 156 m. She was diagnosed with end-stage renal disease and received hemodialysis. She had been administered long-term steroids to treat rheumatoid arthritis. In March 2017, her general condition improved to the point where she could use a wheelchair for ambulation, and surgery was therefore planned. Preoperative computed tomography of her chest revealed a concealed rupture of the diverticular sac, leading to the development of a fistula between the diverticulum and the left lower lobe of the lung and a consequent pulmonary abscess (Fig. 3A, B). However, considering her poor lung function and low performance status, we decided to treat the abscess conservatively. On May 16, 2017, diverticulectomy and 180° posterior partial fundoplication were performed via laparotomy. We made a hole with electrocautery in the diverticulum and drained the fluid inside, which provided us with a better view of the fistula. Then, we divided it with endo GIA staplers (Covidien, Seoul, Korea) from each side (the esophageal side and the left lower lobe) and added 3 or 4 reinforcement sutures below the GIA stapler line of each side. We could not proceed with left lower lobectomy due to the patient’s poor lung function, which was the reason for performing the reinforcement suture for the stapling line. We did not perform myotomy because there was no evidence of a motility disorder. Her postoperative course was uneventful (Fig. 4); she resumed a soft/liquid diet on May 21, 2017 and was discharged on June 1, 2017. Thus far, the patient has not shown any signs of recurrence or complications (Fig. 5). Written informed consents were obtained from the patient. Epiphrenic diverticula are mucosal and submucosal outpouchings of the distal third of the esophagus, which are commonly attributed to the action of pulsion forces . Most patients with epiphrenic diverticula are asymptomatic ; however, epiphrenic diverticula can cause regurgitation or respiratory complaints. Fatal complications include diverticular perforation, progression to carcinoma , and rarely, fistula formation between a diverticulum and the respiratory tract . We describe a patient in whom a diverticulum communicated with the left lower lobe of the lung, leading to a pulmonary abscess. Fistula formation between an epiphrenic diverticulum and the respiratory tract, leading to the development of a pulmonary abscess, is a rare condition, and optimal surgical treatment has not been reported. A few published case reports have described resection of the affected parts of the lungs in patients presenting with severe complications such as respiratory failure or irreversible inflammatory lesions . Notably, conservative treatment for the inflamed lung lesion has shown benefits in a few patients . In this case, the patient did not demonstrate serious respiratory symptoms or markedly elevated inflammatory marker levels. Therefore, considering the patient’s poor lung function, we decided to treat the pulmonary abscess conservatively. The surgical management of epiphrenic diverticula involves several different approaches. The transthoracic approach has been conventionally used, although a few surgeons have recently reported using a transabdominal approach [2,6]. Based on our experience with successful transabdominal resection of diverticula in 12 patients over the past 20 years, in this patient, we dissected the diverticulum via a laparotomy. The transabdominal approach offers a better view of the gastroesophageal junction when performing a partial fundoplication, which represents a distinct advantage of this method . Additionally, the transabdominal approach is associated with less postoperative pain and a shorter hospital stay. To summarize, we consider transabdominal epiphrenic diverticulectomy to be a feasible technique for the management of patients with this presentation. The optimal surgical technique for an epiphrenic diverticulum remains controversial, particularly with regard to whether myotomy is warranted in every case [2,7]. A few authors maintain that myotomy should be selectively performed in patients with a proven motility disorder [5,6]. In this patient, a barium swallow study (esophagogram) did not show any abnormalities in the passage of barium. Additionally, intraoperatively, no esophageal muscle hypertrophy was identified. We did not perform esophageal manometry because she already had undergone several stressful examinations due to the presence of several comorbid conditions, as mentioned above, so we tried to minimize the number of tests required to confirm the diagnosis. In some cases, it is not possible to differentiate the exact cause of esophageal diverticulum even if comprehensive information is available from an esophageal motility study, including manometry results. 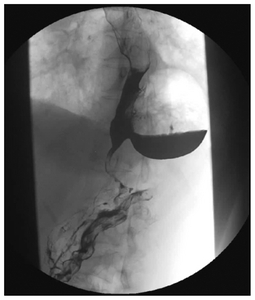 This patient’s diverticulum had been diagnosed and followed by a gastroenterologist because she did not have significant symptoms, such as dysphagia, until the episode of hematemesis. Therefore, we thought that she only required a diverticulectomy. Furthermore, it was crucial to reduce the time and burden of the operation by simplifying the operative technique due to the patient’s comorbidities. For this reason, we did not perform myotomy, and choosing this simplified procedure led to favorable outcomes with a lower risk of complications. Therefore, the patient underwent diverticulectomy and partial fundoplication. We recommend an individualized approach to treat cases of a pulmonary abscess secondary to an esophagopulmonary fistula. Myotomy is not always mandatory in patients without signs of motility disorders. Fig. 1. An esophagogastroduodenoscopic examination revealed a large hematoma inside the diverticulum. Fig. 2. An esophagographic examination showing an epiphrenic diverticulum on the left side of the esophagus. Fig. 3. (A) An image from a lung-window chest computed tomography scan shows an epiphrenic diverticulum communicating with the left lower lobe of the lung. (B) An image from a mediastinal-window chest computed tomography scan of the epiphrenic diverticulum. Fig. 4. 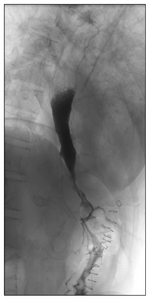 An image of esophagography on postoperative day 1, using gastrograffin. Fig. 5. 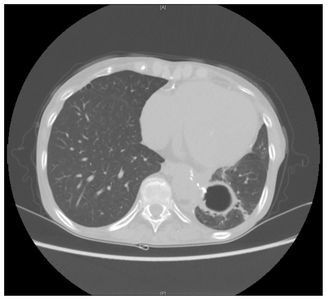 An image from a mediastinal-window chest computed tomography scan on postoperative day 65, showing only an air-containing cavity, corresponding to a change from the lung abscess. Lee, JM, Lee, HS, Shin, JK, and Kim, SH (1990). Surgical treatment of epiphrenic esophageal diverticulum: one case report. Korean J Thorac Cardiovasc Surg. 23, 584-7. Zaninotto, G, Portale, G, Costantini, M, Zanatta, L, Salvador, R, and Ruol, A (2011). Therapeutic strategies for epiphrenic diverticula: systematic review. World J Surg. 35, 1447-53. Altorki, NK, Sunagawa, M, and Skinner, DB (1993). Thoracic esophageal diverticula: why is operation necessary?. J Thorac Cardiovasc Surg. 105, 260-4. Herbella, FA, and Del Grande, JC (2010). 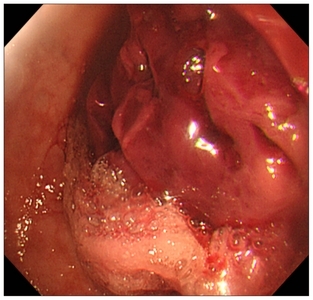 Benign esophagopulmonary fistula through an epiphrenic diverticulum and asymptomatic achalasia. Dig Dis Sci. 55, 1177-8. De Giacomo, T, Francioni, F, Venuta, F, Rendina, EA, and Ricci, C (1993). Benign esophageal-respiratory fistulae: the surgical treatment and results of 10 cases. Minerva Chir. 48, 311-6. Benacci, JC, Deschamps, C, Trastek, VF, Allen, MS, Daly, RC, and Pairolero, PC (1993). Epiphrenic diverticulum: results of surgical treatment. Ann Thorac Surg. 55, 1109-13. Soares, R, Herbella, FA, Prachand, VN, Ferguson, MK, and Patti, MG (2010). Epiphrenic diverticulum of the esophagus: from pathophysiology to treatment. J Gastrointest Surg. 14, 2009-15.